Natasha Jane Richardson (11 May 1963 – 18 March 2009) was an English-American actress of stage and screen. Richardson was a member of the Redgrave family, being the daughter of actress Vanessa Redgrave and director/producer Tony Richardson, and the granddaughter of Michael Redgrave and Rachel Kempson. Early in her career, she portrayed Mary Shelley in Ken Russell's Gothic (1986) and Patty Hearst in the 1988 biopic film directed by Paul Schrader, and later received critical acclaim and a Theatre World Award for her Broadway debut in the 1993 revival of Anna Christie. She also appeared in The Handmaid's Tale (1990), Nell (1994), The Parent Trap (1998), Maid in Manhattan (2002) and The White Countess (2005). 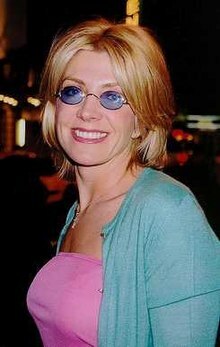 Natasha Jane Richardson (11 May 1963 – 18 March 2009) was an English-American actress of stage and screen. Richardson was a member of the Redgrave family, being the daughter of actress Vanessa Redgrave and director/producer Tony Richardson, and the granddaughter of Michael Redgrave and Rachel Kempson. Early in her career, she portrayed Mary Shelley in Ken Russell's Gothic (1986) and Patty Hearst in the 1988 biopic film directed by Paul Schrader, and later received critical acclaim and a Theatre World Award for her Broadway debut in the 1993 revival of Anna Christie. She also appeared in The Handmaid's Tale (1990), Nell (1994), The Parent Trap (1998), Maid in Manhattan (2002) and The White Countess (2005). She won the Tony Award for Best Performance by a Leading Actress in a Musical, the Drama Desk Award for Outstanding Actress in a Musical, and the Outer Critics Circle Award for her performance as Sally Bowles in the 1998 Broadway revival of Cabaret. Richardson died on 18 March 2009 from an epidural hematoma after hitting her head in a skiing accident in Quebec. Richardson was born and raised in Marylebone, London, a member of the Redgrave family, known as a theatrical and film acting dynasty. She was the daughter of director and producer Tony Richardson and actress Vanessa Redgrave, granddaughter of actors Sir Michael Redgrave and Rachel Kempson, sister of Joely Richardson, half-sister of Carlo Gabriel Nero and Katharine Grimond Hess, niece of actress Lynn Redgrave and actor Corin Redgrave, and cousin of Jemma Redgrave. Richardson's parents divorced in 1967. The following year, she made her film debut at the age of four in an uncredited role in The Charge of the Light Brigade, directed by her father. Richardson was educated in London at two independent schools, the Lycée Français Charles de Gaulle in South Kensington, London, and St. Paul's Girls' School in Hammersmith, London, before training at the Central School of Speech and Drama. Richardson began her career in regional theatre at the West Yorkshire Playhouse in Leeds, and, in 1984, at the Open Air Theatre in London's Regent's Park, when she appeared in A Midsummer Night's Dream with Ralph Fiennes and Richard E. Grant. Her first professional work in London's West End was in a revival of Anton Chekhov's The Seagull in 1985. This production also featured her mother, Vanessa Redgrave. Soon afterward she starred in a London stage production of High Society, adapted from the Cole Porter film. She made her Broadway debut in 1993, in the title role of Anna Christie, which is where she met future husband Liam Neeson. In 1998, she played the role of Sally Bowles in Sam Mendes' revival of Cabaret on Broadway, for which she won the Tony Award for Best Actress in a Musical. The following year she returned to Broadway in Closer, for which she was nominated for the Drama Desk Award for Outstanding Featured Actress in a Play, and in 2005, she appeared again with the Roundabout, this time as Blanche DuBois in the revival of Tennessee Williams's A Streetcar Named Desire, opposite John C. Reilly as Stanley Kowalski. In January 2009, two months before her death, Richardson played the role of Desirée in a concert production of Stephen Sondheim's A Little Night Music, with her mother Vanessa Redgrave who played Mme. Armfeldt. At the time of Richardson's death, the pair were preparing to co-star in a Broadway revival of the musical. In 1984, Richardson made her first credited screen appearance as an art tutor in the James Scott-directed Every Picture Tells A Story, based on the early life of the painter William Scott. She later starred as Mary Shelley in the 1986 film Gothic, a fictionalised account of the author's creation of Frankenstein. The following year she starred with Kenneth Branagh and Colin Firth in A Month in the Country, directed by Pat O'Connor. Director Paul Schrader signed her for the title role in Patty Hearst, his 1988 docudrama about the heiress and her kidnapping. Her performances with Robert Duvall and Faye Dunaway in The Handmaid's Tale and Christopher Walken, Rupert Everett and Helen Mirren in The Comfort of Strangers (directed by Schrader) won her the 1990 Evening Standard British Film Award for Best Actress. In 1991, she appeared in The Favour, the Watch and the Very Big Fish with Bob Hoskins. He later credited her with giving him the best kiss of his life during the film. "She got hold of me and kissed me like I've never been kissed before. I was gobsmacked". Richardson was named Best Actress at the 1994 Karlovy Vary International Film Festival for Widows' Peak, and that same year appeared in Nell with Jodie Foster and future husband Liam Neeson. Additional film credits include The Parent Trap (1998), Blow Dry (2001), Chelsea Walls (2001), Waking Up in Reno (2002), Maid in Manhattan (2002), Asylum (2005), which won her a second Evening Standard Award for Best Actress, The White Countess (2005), and Evening (2007). Her last screen appearance was as headmistress of a girls' school in the 2008 comedy Wild Child. During the last week of January 2009, she recorded her offscreen role of the wife of climber George Mallory, who disappeared while climbing Mount Everest during a 1924 expedition, in the 2010 documentary film The Wildest Dream, for which Liam Neeson provided narration. Director Anthony Geffen described listening to the film since her death as "harrowing". Richardson made her American television debut in a small role in the 1984 miniseries Ellis Island. That same year she made her British television debut in an episode of the BBC series Oxbridge Blues. The following year she appeared as Violet Hunter with Jeremy Brett and David Burke in The Adventures of Sherlock Holmes in the episode entitled "The Copper Beeches". She starred with Judi Dench, Michael Gambon and Kenneth Branagh in a 1987 BBC adaptation of the Henrik Ibsen play Ghosts; with Maggie Smith and Rob Lowe in a 1993 BBC adaptation of Suddenly, Last Summer by Tennessee Williams; as Zelda Fitzgerald in the 1993 television movie Zelda; and Haven (2001) on CBS and The Mastersons of Manhattan (2007) on NBC. Richardson's first marriage was to filmmaker Robert Fox, whom she had met in 1985, during the making of Anton Chekhov's The Seagull; they were married from 1990 to 1992. She married actor Liam Neeson in the summer of 1994 at the home they shared in Millbrook, New York; and had become a naturalized American citizen. Richardson had two sons with Neeson: Micheál (born 1995) and Daniel (born 1996). Richardson helped raise millions of dollars in the fight against AIDS; her father Tony Richardson had died of AIDS-related causes in 1991. Richardson was actively involved in AmfAR; she became a board member in 2006, and participated in many other AIDS charities, including Bailey House, God's Love We Deliver, Mothers' Voices, AIDS Crisis Trust, and National AIDS Trust, for which she was an ambassador. Richardson received amfAR's Award of Courage in November 2000. A long-time smoker, although she had reportedly quit smoking, Richardson was an outspoken critic of the ban on smoking in New York City restaurants. On 16 March 2009, Richardson sustained a head injury when she fell while taking a beginner skiing lesson at the Mont Tremblant Resort, about 80 miles (130 km) from Montreal, Quebec. She was flown to Lenox Hill Hospital in New York City, where she died two days later from an epidural hematoma. Richardson's family issued a statement the day of her death: "Liam Neeson, his sons, and the entire family are shocked and devastated by the tragic death of their beloved Natasha. They are profoundly grateful for the support, love, and prayers of everyone, and ask for privacy during this very difficult time." On 19 March 2009, theatre lights were dimmed on Broadway in New York City and in London's West End as a mark of respect for Richardson. The following day, a private wake was held at the American Irish Historical Society in Manhattan. On 22 March 2009, a private funeral was held at St. Peter's Episcopal Church near Millbrook, New York, close to the family's upstate home, and Richardson was buried near her maternal grandmother Rachel Kempson in the churchyard. Richardson's aunt, Lynn Redgrave, was buried in the same churchyard on 8 May 2010, near Richardson and Kempson. 1985 The Adventures of Sherlock Holmes Violet Hunter Episode: "The Copper Beeches"
↑ "Quick treatment could have saved Richardson". MSNBC. 19 March 2009. Archived from the original on 20 March 2009. 1 2 3 4 5 "Natasha Richardson part of legendary acting family". CNN. 18 March 2009. Archived from the original on 21 March 2009. Retrieved 18 March 2009. ↑ "Natasha Richardson Leaves Bulk of Assets to Husband Liam Neeson". Fox News Channel. 31 May 2009. Archived from the original on 26 September 2010. ↑ Arnold, Laurence; Peter S. Green (19 March 2009). "Natasha Richardson, Actress of Elegance, Pedigree, Dead at 45". Bloomberg. Archived from the original on 19 October 2008. Retrieved 19 March 2009. 1 2 Pulleine, Tim (19 March 2009). "Natasha Richardson The daughter of actor Vanessa Redgrave and director Tony Richardson was destined for the theatrical profession". The Guardian. London. Archived from the original on 6 September 2013. Retrieved 19 March 2009. ↑ Singh, Anita (19 March 2009). "Natasha Richardson skiing accident in Canada: profile of actress". The Daily Telegraph. London. Archived from the original on 22 March 2009. Retrieved 19 March 2009. ↑ Weber, Bruce (18 March 2009). "Natasha Richardson, actress, Dies at 45". The New York Times. Archived from the original on 1 April 2009. Retrieved 19 March 2009. ↑ "Aesthetica Magazine – James Scott: Every Picture Tells A Story, London". Aesthetica. Archived from the original on 8 December 2015. Retrieved 2015-12-02. ↑ Greenstreet, Rosanna (18 June 2011). "Q&A: Bob Hoskins". The Guardian. Archived from the original on 10 November 2013. Retrieved 18 June 2011. 1 2 "Director: Natasha Richardson "Powerful and Harrowing" in Final Film". Us Weekly. 19 March 2009. Archived from the original on 22 March 2009. Retrieved 22 March 2009. ↑ "Obituaries – Natasha Richardson". The Daily Telegraph. 19 March 2009. Archived from the original on 15 June 2012. Retrieved 4 June 2012. ↑ "Natasha Richardson: Member of celebrated acting family who found success on stage and screen – Obituaries, News". The Independent. London. 20 March 2009. Archived from the original on 23 March 2009. Retrieved 18 November 2009. ↑ Middlekauff, Tracey (2009). "Fighting AIDS in Memory of Her Father". People. Archived from the original on 7 May 2009. Retrieved 21 March 2009. ↑ "amfAR :: Natasha Richardson :: The Foundation for AIDS Research :: HIV / AIDS Research". amfar.org. Retrieved 17 August 2015. ↑ Bearn, Emily (27 April 2003). "Prime Time for Natasha". The Daily Telegraph. London. Archived from the original on 31 March 2009. Retrieved 19 February 2009. ↑ Chui, Alexis (24 March 2009). "Natasha Richardson: 'She Was So Much Fun'". People. Archived from the original on 3 June 2009. ↑ Franck, Elisabeth (8 April 2001). "Cigarette Aficionados Go to War". The New York Observer. Archived from the original on 28 September 2008. Retrieved 19 March 2009. ↑ "Neeson opens up on death of wife: 'It still kind of isn't real'". ↑ "Grave of Natasha Richardson at St. Peter's Episcopal Cemetery in Lithgow". ↑ Weber, Bruce (19 March 2009). "Natasha Richardson, actress, Dies at 45". The New York Times. Archived from the original on 31 March 2011. Retrieved 28 February 2011. ↑ "Richardson gets West End tribute". BBC News. 20 March 2009. Archived from the original on 23 March 2009. Retrieved 23 March 2009. ↑ "Natasha Richardson buried in New York". 23 March 2009. Archived from the original on 19 January 2012. Retrieved 24 March 2009. ↑ "Family bid farewell to Richardson". BBC News. 22 March 2009. Archived from the original on 25 March 2009. Retrieved 23 March 2009. ↑ "Natasha Richardson Buried Near Upstate NY Home". The Canadian Press. 23 March 2009. Archived from the original on 13 April 2016. Retrieved 23 March 2009. 1 2 3 4 5 Weber, Bruce (2009-03-18). "Natasha Richardson, 45, Stage and Film Star, Dies". The New York Times. ISSN 0362-4331. Archived from the original on 12 April 2016. Retrieved 2017-05-07. 1 2 3 4 "Natasha Richardson: Obituary". Telegraph.co.uk. Archived from the original on 11 December 2011. Retrieved 2017-05-07. 1 2 3 4 5 6 7 8 9 10 11 12 13 14 15 "Natasha Richardson dies at 45". Los Angeles Times. 2009-03-19. ISSN 0458-3035. Archived from the original on 1 May 2017. Retrieved 2017-05-07. ↑ "The Comfort of Strangers". Rolling Stone. Archived from the original on 27 August 2016. Retrieved 2017-05-07. ↑ "The Favour, the Watch and the Very Big Fish". Find and Watch. Retrieved 2017-05-07. ↑ "Past Midnight | e.tv". ekasiplus.etv.co.za. Retrieved 2017-05-07. ↑ Scott, A. O. (2001-03-07). "FILM REVIEW; The Full Gel, Curlers and Cream Rinse - NYTimes.com". The New York Times. Retrieved 2017-05-07. ↑ "request | Filmmaker Magazine". Filmmaker Magazine. Retrieved 2017-05-07. ↑ "Movie review: It may be hard to stay awake in Waking Up in Reno'". DeseretNews.com. 2002-11-15. Retrieved 2017-05-07. 1 2 3 4 5 "Natasha Richardson: Member of celebrated acting family who found". The Independent. 2009-03-20. Archived from the original on 4 March 2016. Retrieved 2017-05-07. ↑ "HBO CLASSIC: TALES FROM THE CRYPT S7". HBO Watch. 2012-11-04. Retrieved 2017-05-07. ↑ "Natasha Richardson Cast in NBC's 'Mastersons of Manhattan' Pilot | Playbill". Playbill. 2007-01-24. Retrieved 2017-05-07. ↑ "Natasha Richardson Dies After Ski Accident". Archived from the original on 3 July 2016. Retrieved 2017-05-07. ↑ Wolf, Matt (2003-06-01). "Review: 'The Lady From the Sea'". Variety. Archived from the original on 30 June 2016. Retrieved 2017-05-07. Wikimedia Commons has media related to Natasha Richardson.